Learn about some of the best activities for adventure-seekers in South Africa, from shark cage diving to seeing the Big Five on safari. From cage diving with great white sharks and hot air ballooning high above Johannesburg, to riding ATVs through a winery and heading out on safari, South Africa is filled with opportunities for adventure. Not to mention that the country is also a trending destination for 2018, having landed a spot on Lonely Planet’s list for where to travel this year. It’s safe to say that if you’re hoping to discover adventure, South Africa is the ideal destination to do it. Here are some of the best adrenaline-pumping activities to try in this adventure travel destination. One of the most unforgettable experiences I had in South Africa was seeing it from high above the ground from the basket of a hot air balloon. About an hour north of Johannesburg is Magalies River Valley, known as one of the best areas in the country to go hot air ballooning for the stunning views it offers of the countryside and lush valleys below. The adventure starts well before dawn when you’ll see the flight crew slowly inflate a giant balloon for your early morning ride. You’ll start with a gentle takeoff and hover above the tree line, and then leisurely drift to heights of around 1000 feet. If you’re lucky (as I was), you might catch a glimpse of a giraffe or impala loping by below. There’s a reason going on safari in South Africa makes it the top of so many adventure travel bucket lists (including mine). Getting a chance to spot the Big Five (elephant, lion, rhino, leopard, and buffalo) is an exhilarating thought, and while I didn’t catch sight of the elusive leopard outside of a wildlife refuge, there’s still nothing like seeing a herd of elephants grazing just beyond your safari vehicle, or watching lazy lions snooze under a shade tree. 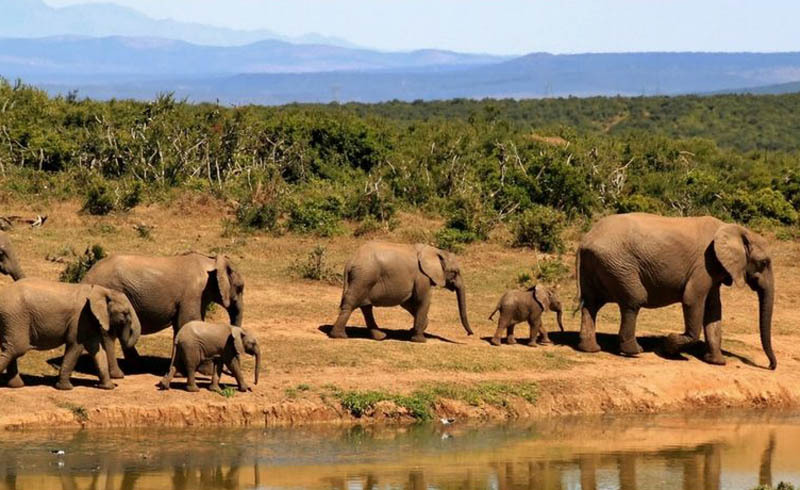 One of the best places to go on safari is in Kruger National Park, the largest game reserve in South Africa, which was established in 1898 to protect the wildlife of the South African Lowveld. Accommodations on safari include campsites, simple huts, bungalows, or—if budget allows—luxury safari lodges. No matter where you stay, the highlight will likely be early morning and late afternoon game drives with an experienced guide who can help you spot the Big Five (and the Little Five: buffalo weaver, elephant shrew, leopard tortoise, ant lion and rhino beetle). The May to October dry season is the best time to plan a South African safari adventure. Cape Town is one of the best places in the world to get up close and personal with great white sharks. Dyer Island in Gansbaai is known as “Shark Alley” and is home to the densest populations of great white sharks in the world. Gansbaai is a scenic two-and-a-half-hour drive from Cape Town and there are many tour operators in and around the area offering a variety of options, from half-day to multi-day shark-viewing excursions. Following an obligatory safety briefing, there’s a boat ride to the dive site, the cage is lowered into the water and then everyone takes turns donning dive gear and heading into the cage see the sharks. Tours are offered year-round. 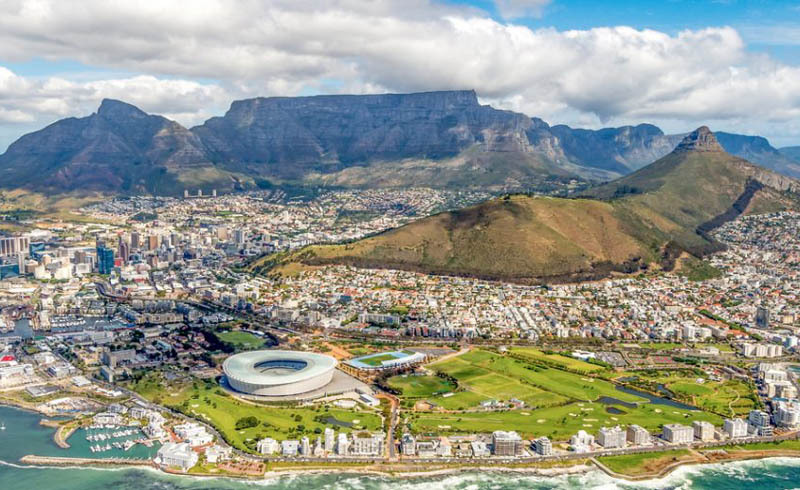 The most iconic landmark in South Africa is also one of the New7Wonders of Nature, which ranks alongside other impressive wonders like Halong Bay in Vietnam and Jeju Island in South Korea. The flat-topped mountain soars over 3500 feet in the air above Cape Town, offering Instagram-worthy views of the city below as well as Table Bay and the surrounding mountains. Over 350 trails lead to the top suited to all levels types of hikers. Platteklip Gorge is the most popular hiking route and one which zigzags up the mountain as if you were climbing a large but very scenic set of stairs. Alternatively, you can ride the rotating cable car, which has been smoothly whisking people to the top of Table Mountain since 1929. The five-minute ride is the quickest and easiest way to the top for anyone who doesn’t have time to hike, which usually takes between 90 minutes to three hours one way. If you’re really feeling adventurous, Abseil Africa offers visitors a chance to take on the highest abseil—or rappelling route—in the world, at 3280 feet. No matter your level of adventure there’s an adrenaline-boosting activity in South Africa to suit your needs. Thinking of booking a trip? What adventure activities are you most looking forward to trying?